By June 1916 work on the "Big Push" was well under way although only a few high ranking officers knew of the exact date this major offensive was to happen. The first few days saw the Lonsdales, along with their comrades of the 97th Brigade, the 16th and 17th Highland Light Infantry and the 2nd King’s Own Yorkshire Light Infantry, form part of Divisional Reserve at Bouzincourt. During this time the days were quiet inasmuch as there was no involvement in any particular action worthy of note. However, for three weeks prior a volunteer group of Lonsdales, under the Command of Lieut. William Barnes, had spent much of that time training for what was hoped a successful outcome in discovering the dispositions of the German trenches at the strong-hold along the Leipzig Salient. It was already documented as position of strength, held on the higher ground overlooking the British positions across No Man's Land towards the village of Authuille and Authuille Wood. But there had been some unusual activity observed and it was unclear as to what what happening on the German side. 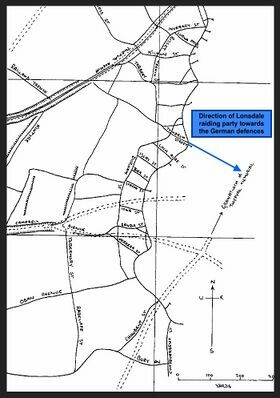 To learn more about this potential threat to the British line opposite the salient, an important mission was carried out on the night of the 5 June, which would secure important intelligence that could be used when the time to advance came. 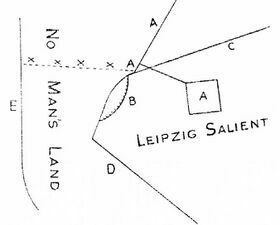 It was imperative to record and map in as much detail as possible the German trench system at the northern end of what was called the Granatloch (Chalk Quarry) of the Leipzig Salient along with the Bull’s Eye (which comprised of dug-outs at least 22ft below ground) and the Leipzig Redoubt, which too, was heavily fortified. Simple sketch map showing location of the Bull's Eye, Granatloch and the point of entry. 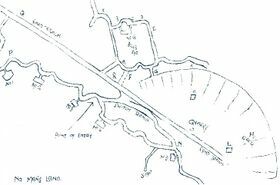 Simple sketch showing British trenches in the Authuille Sector with Tyndrum Street, the Lonsdale raiding party's launching off site. The strategical value and overall importance of this raid was realised when orders were given to dig a trench system three miles behind the British lines near Bouzincourt. With the aid of aerial photographs every corner and section of line was accurately reproduced with the purpose of providing a training ground, used to the raiding party’s advantage. Re-creating a replica of the enemy ground brought with it many advantages. Every man would commit to memory his precise movements and, providing there was not too much resistance on the night, would complete the mission with some element of surprise, something of strategical importance in its own right. The Lonsdales needed a point of entry and found a suitable one located near the Granatloch. The nature of the ground here provided a weakness in the German lines insofar as the quarry itself was on a reverse slope and thus incapable of direct observation. However, the use of spotter planes to confirm the suitable entry point and to photograph the entire site in as much detail as possible, would almost certainly have forewarned the Germans that the Allies were up to something. Whilst they wouldn't know what the Allies were planning, the chances are they would have, at least in part, readied themselves to the possibility of a raid (or something of equal threat) and, therefore, the element of total surprise would no longer be viable. “The programme of training varied slightly, but nearly every night the actual advance was practised under the eye of the C.O. and the most minute details criticised and modified. During the day bomb-throwing was practiced, and the men had two hours’ physical training, also instruction in conducting prisoners and carrying wounded. “By the time the party moved from Bouzincourt to their final bivouac in Aveluy Wood, every man knew his job and his exact place in the scheme. “We moved up at 9pm and got into position at 10pm. At 10.20pm the tape-laying party moved across No Man’s Land in the direction of the point of the Leipzig Salient, Lieut. Margerison leading. The Boche probably expected us to go out at Oban Avenue, as it was the most direct line of approach, but we went out at Tyndrum [Street], about 100 yards north of Oban [Avenue]. At 10.30pm the enemy put over several salvoes of 12 pounders immediately at the head of Oban, which would certainly have caused heavy losses had the raiding party been there. At 10.35pm the Ammonal torpedo party followed along the tape, halted, and lay down half-way across, the main body following and lying down immediately behind the torpedo party. “At about 11 o’clock the bombardment of the enemy trenches began, and lasted till 11.13’, when the artillery “lifted” and fired on points behind the front line, allowing the raiding party to go forward. At 11.13’ the torpedo party went forward and exploded what remained of the enemy wire, leaving and entrance for the main body. Lieut. Mckerrow went forward to the Bull’s Eye and explored it, succeeding in taking several prisoners, and returned after staying about 10 minutes. Sixteen prisoners were taken in all, eleven of whom were safely conducted to our trenches. The remaining five were killed in offering resistance or while attempting to escape. The raid itself was successful mostly "due to the great care that he [Lieut. Barnes] took in training the party, and his leadership was up to the end most splendid." A private by the name of Christopher Thwaites who took part in the raid was very much saddened by the loss of Lieut. Barnes, an officer held in high regard amongst the men. He was killed along with three other men when looking for his missing revolver on returning to No Man’s Land. Colin Bardgett, author of The Lonsdale Battalion 1914-1918 briefly covers the raid and the loss of Barnes with just a few compelling words remarking how "this seems a sad waste of a life for one revolver." A statement true and without doubt synonymous with war. Raids such as this can be practiced time and time again to ensure every possible outcome is covered, however, in reality things do not always as intended. Unforeseen elements can play out differently and that, ultimately, changes the outcome. The raid of 5/6 June went mostly to plan and the information gained was both detailed and accurate. Diagrams of the German trench system along with dug-out locations and depths provided the Allies with the information they were looking for, information they could use against them when the time came. The Corps Commander Lt-Gen Sir T.L.N. Morland (Commander of Xth Corps) inspected the raiders the following day and gave them hearty congratulations for their work. Unfortunately, the week-long British bombardment at the Leipzig Salient before the big push was not as effective as the Allies had hoped. There was no disputing that the German-engineered dug-outs were strong, very strong. It was apparent that their depths and superior construction protected those taking shelter within them and as a result of this the Allies had overestimated the German casualties after such a harassing, yet forlorn, salvo. ↑ 2.0 2.1 2.2 Michael Stedman (2005). Thiepval: Battleground Somme. Pen & Sword Books Ltd. ISBN 1844153509. p.48. ↑ 3.0 3.1 Colonel H.C. Wylly, C.B. (1925). The Border Regiment in the Great War. Gale & Polden Ltd. ISBN 1847342728. p.77. ↑ 4.0 4.1 Michael Stedman (2005). Thiepval: Battleground Somme. Pen & Sword Books Ltd. ISBN 1844153509. p.49. ↑ 97th Brigade War Diary, WO 95/2399. This page was last edited on 21 April 2017, at 15:17.